Laser hair removal India represents a revolution in hair removal by disabling hundreds of hair follicles in seconds and by promising long lasting results. Mortifying waxing experiences. Goopy at-home creams. Last-minute bikini season shaving. When it comes to removing unwanted body hair, you’ve put yourself through the ringer. But with Empathy's Light Sheer Laser Hair Removal treatment, you’ll say goodbye to everyday shaving – and get used to skin that’s smooth and stubble-free. What can I expect from laser hair removal? At Empathy Laser Hair Removal Clinic, we have performed several laser hair removal India treatments. Quite simply, we know what works – and we’re leaders in our field. Our team ensures that our methods and training programs exceed industry standards, and we’re constantly evolving to meet our clients’ needs. So you can be confident that you’re getting the safest, most effective treatment at the best possible value. After completing the treatment, clients describe the experience as nothing short of a lifestyle change; most can’t believe they ever spent so much time and money bothering with razors, creames or waxing. Our Light Sheer laser hair removal system uses a combination of energy and heat to destroy follicles without harming the skin around them. After a series of sessions, you’ll experience permanent hair reduction. Depending which area(s) you decide to treat, you’ll always be ready to slip into a swimsuit, won’t have to think about razor burn or irritation, and will stop worrying about unsightly ingrown hairs. 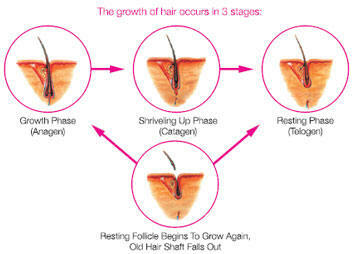 You have millions of hair follicles in your body, all of which cycle through different phases. Laser hair removal can only treat a certain percentage of those follicles at a time (those that are in the active phase), so it must be done at varied intervals. Because no two bodies are the same, your treatment plan will be tailored specifically to you, but we typically recommend at least eight to ten laser hair removal sessions. With laser hair removal, nobody will know you’re undergoing treatment (unless, of course, you want them to). Laser hair removal sessions can be as short as fifteen minutes, and we just ask that you stay out of the sun, shave the area to be treated; and avoid using lotions, creams or products, for optimum results. Most clients describe the sensation as a mild “hot pinch,” similar to the feeling of being snapped with a rubber band. In most cases, the sensation goes away almost immediately. Who qualifies for laser hair removal? We customize your laser hair removal treatment to match your hair color, skin color and type. As part of your package purchase, you also obtain an Specific Plan Membership. Once the initial Two-Year Specific Plan has expired, this Membership allows you to receive discounted treatment rates if you decide continued service is needed. Membership pricing applies only to areas previously treated. Please see your Clinic Manager for specific details. 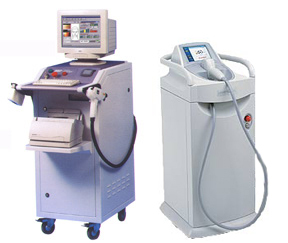 We carry the latest models of the Light Sheer laser (Diode laser, top XC Model) and the Epilight (Intense Pulsed Light). Both of these lasers are FDA approved for permanent hair reduction and have been shown to provide excellent results with all types of hair and skin colors. Depending on your skin tone and color, and the coarsness and darkness of your hair, the doctor will decide which laser would be best for your specific needs. However, we prefer to use the Light Sheer on most of our patients because it is faster, and provides extra skin cooling protection via it's chill tip. It is very important to protect the top layers of the skin from becoming too hot during a laser treatment. Many lasers have different cooling mechanisms to protect the top skin, however, none of them can match the cooling protection which is provided by the Light Sheer's contact cooling Chill Tip. The tip of the Light Sheer is made of saphire which conducts heat very quickly. This saphire tip is constantly cooled to 5 degrees by the control of the laser's computer. When the tip of the laser is placed on the skin, it cools down the upper layer of the skin and protects it from getting too hot. This allows us to use higher energies at a safe level, and thus obtain better results. Combination of Nd:Yag & Diode Lasers, lasers from America and US : FDA approved for India skin type. Hair grows in cycles, and many factors influence its growth, Age, ethnicity, medications, hormones levels, and even location of the hair on the body influence the length, coarseness and colour of hair . 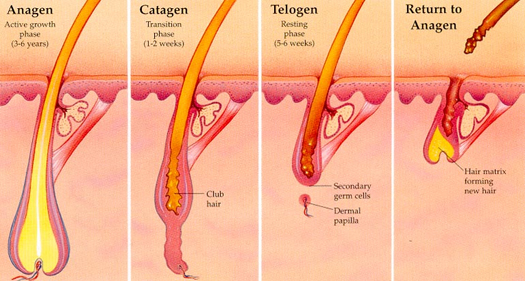 Catagen is the regression phase when the lower part of the hair stops growing but is not shed, and the body absorbs the lower third of the follicle. Telogen is the resting phase. The hair bulb is no longer present and is now a club hair which will fall out or be pushed out of the follicle by the new anagen growing hair . Laser hair removal is a non invasive procedure, by which unwanted hair are removed from any part of the body by utilizing a long pulsed laser. The laser parameters are carefully defined by studying the anatomy of the hair follicle and precisely matching the laser light and pulse duration to the follicle size, depth and location to inhibit the re-growth of the hair. Laser hair removal technique helps in facial hair removal and permanent hair removal. Laser hair removal is performed by a specially - trained laser technician or a doctor, who directs the light of a long pulsed laser onto the skin. Since other hair will enter their growth cycle at different times, several sessions are necessary to destroy all the follicles in a treatment area. Both men and women seek laser hair removal to get unwanted hair removed. Hair removal is commonly done on the hairline, eyebrow, top of the nose, side burn, upper & lower lip, chin, ear lobe, face, neck, nape, shoulders, back,, underarm, abdomen, buttocks, public area, bikini lines, thighs, breast, arms, legs, hands, and toes. The US : FDA has approved the process as "Permanent Reduction" which means that one shouldn't expect laser to remove every single hair from an area. Some might need touch up treatments once or twice a year after the initial set of treatments for any new growth the body may develop. Following precautions are expected from a patient during the course of the entire treatment. No waxing or removing hair from the root by any other way. After treatment is completed, aloe vera should be applied to soothe the skin. Exfoliating and/or scrubbing gently in the shower with a loofa after the treatment may help speed up the shedding process of hair. How long before I can flaunt my new look? The number of treatments depends on the skin and hair colour, density and coarseness of the hair as well as the specific area to be treated. On an average , 5 - 7 treatments, scheduled 4 to 6 weeks apart will approximately reduce hair growth by 70 - 90 % . Additional session might be required to eliminate the hair that come out of the dormant phase and become active later. How about reducing the density of the hair and not completely removing them? Yes, This can be achieved. Please contact our doctors who will help you with the process and consult accordingly. • Is Laser Hair Removal Safe? • How the LightSheer Laser works? • What Can You Expect ? The LightSheer diode laser is the most fantastic, state of the art system specifically designed to remove unwanted hair fast. There is less discomfort and the laser itself is the most reliably compared to any other laser around and it permanently reduces your unwanted hair. Best of all, you will need fewer sessions to get the job done than with any other laser around. The LightSheer was the first diode laser that has been approved by the FDA for permanent hair reduction. Yes, it is safe. By now, there have been more studies done with the LightSheer laser than any other laser around. The LightSheer was developed from years of research at the Massachusett's General Hopsital's Wellman Laboratories of Photomedicine, one of the world's leading research institutions. The laser parameters were carefully designed to inhibit the regrowth of hair by studying the anatomy of the hair follicles. The actively cooled sapphire hand piece was designed to conduct heat away from the skin before, during and after each pulse. Proper eye protection is an important feature during any laser treatment. For safety, laser hair removal is not recommended when pregnant. People treated commonly experience reddening of the skin, follicular swelling and histamine/hive reactions. Most skin reactions resolve within 1 to 2 hours but can last up to 24 - 48 hours after the treatment. Other temporary adverse side effects like hyperpigmentation (darkening of the skin) or hypopigmentation (lightening of the skin) is possible, but not common. It is important thata you lower your risks of pigmentationn changes by following the pre and post treatment instructions. Avoid sun exposure, suntan beds and self-tanning lotions. It is important that you protect your skin by wearing a sunscreen or a sunblock. How the LightSheer Laser works ? A laser produces a beam of highly concentrated light. The light emitted by the LightSheer diode laser is well absorbed by the pigment (melanin) in the hair follicles. Prior to the procedure, the treatment area has to be shaved. During the procedure the upper layer of the skin is compressed and cooled with the special cooling handpiece. This procedure protects the skin and makes the procedure more effective. Then the laser pulses light for a fraction of a second, just long enough to heat up the hair and destroy the follicle's ability to re-grow. The result - permanent hair reduction in the treated area. The length of a laser treatment may last anywhere from a few minutes to an hour or more, depending on the size of the area being treated. It is important to know that the hairs in an active growth phase (referred to as Anagen) are most affected by the laser. As all hairs are not in this phase at the same time, more than one treatment will be necessary to achieve the best result. 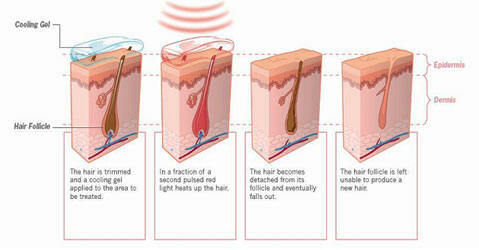 Most individual's permanent hair loss will be between 50 - 85% after 3 treatments. Most people need 4 - 6 treatments in total. The hair that is left is usually lighter and finer than the original hair. Very Important! 6 weeks prior to Laser Hair Removal do NOt wax or tweeze, No threading, No electrolysis. • ONLY SHAVING is allowed! • Do not tan the areas to be treated for 4 weeks prior to the treatment. • Do not apply moisturizers or makeup on the skin to be treated. • You need to be freshly shaven on the area(s) your want to have lasered. Apply EMLA, a topical anaesthetic cream to the area you want to have treated approximately 2 hours before the treatment. Apply Emla about 1/8 inch thick to the area. Like icing a cake. For bigger areas you will need 30 - 60 gr of Emla. Apply the cream so that it is still white on the skin, wrap Saran wrap over it to keep the cream moist and effective. We will remove the cream in the salon before the treatment. Take a pain medication 20 - 30 minutes before the treatment is you have a problem with pain. We offer our clients a more efficient topical anesthetic that we apply for you in the salon in which case you need to come in 20 minutes earlier. 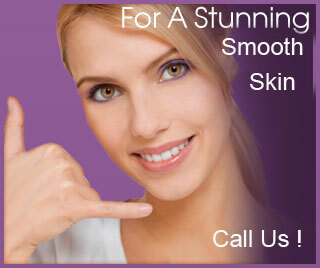 That service is a choice we offer and is not included in the laser hair removal cost. Some redness and swelling in the area after the treatment is normal. It may feel similar to a sunburn. This usually resolves within a few hours after the treatment. For some people it may take a few days. You can cool treated areas with a cold face cloth. DO NOT use chemical packs. Apply a soothing Aloe Vera or Vitamin E Gel to the treated area twice a ay for 5 to 7 days after the treatment, or until the sunburned feeling has subsided. Clean the area gently twice a day. Clients should use the highest factor sunblock and sunscreen. You must protect the treated area from exposure to sunlight, sunbed or other artificial tanning between the treatments. Avoid irritants (glycolic acid, retinoids, chemical peels etc) for 7 days after the treatment. Avoid perfumes, strong soaps, makeup and deodorants until any stinging has subsided. Avoid hot baths, hot tubs and working out for 24 hours after Laser Hair Removal. Do not pluck or wax after your treatment. You may shave the treated area to keep it tidy if need be.